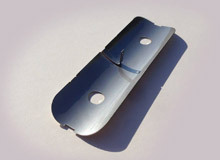 Progressive Stampings – G & M Manufacturing Corp.
A die is a press tool for cutting or forming material in a stamping machine, and this process utilizes several dies together on the same piece of sheet metal, and as a result is capable of encompassing punching, coining, bending and many other ways of shaping blanks, or raw metal material, into various parts and components. Since multiple dies stamp the sheet metal at the same time, progressive die stamping is able to combine forming and cutting processes for efficiency and economy. This metal stamping process is used to form small metal components quickly, and as a result is used in many applications requiring high-precision. 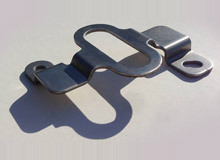 Some examples of applications and industries that progressive stampings are utilized in include: medical, for critical components such as surgical instrumentation and dental grinding disks; industrial manufacturing, for use in the production of tools and automation equipment components; food and beverage, utilized in various forms of packaging such as lids for pop cans; and automotive, in which they are used as braking systems, fuel delivery systems and bayonet sockets. There is a wide range of materials that can be formed using the progressive die stamping process, which includes: most aluminum alloys, brass, cold rolled steel, copper, zinc, stainless steel, titanium and galvanized steel. To begin the progressive die stamping process, first strips of metal are pushed by a feeding system through a series of progressive stamping die stations. The dies in these stations are housed within a reciprocal stamping press, typically hydraulically-powered. The reciprocal stamping press stamps the material by the process of the press moving up and the top die moving with it so that when the press moves back down so does the die, which results in the stamping of the material. Additional work is performed at each station that the material is brought through. Although the cost of the multiple dies that are used in progressive die stamping are expensive, they usually last for the life of the project. Manufactured from tool steel, the dies offer many advantageous characteristics such as high abrasive force resistance, high shock load resistance and the ability to retain a sharp cutting edge. Thus, despite the initial cost, the final price per piece is exceptionally low. Progressive Stampings Progressive stampings are formed through a metal forming process that is often referred to as progressive die stamping.